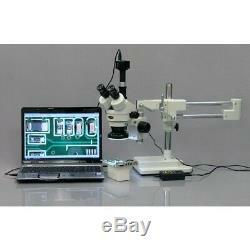 AmScope 3.5X-45X Trinocular Stereo Microscope with 4-Zone 144-LED Ring Light. 3.5X-45X super widefield zoom magnification. 8" large working distance and 2-1/2" field of view. Powerful 4-zone 144 LED ring light with dimmer. 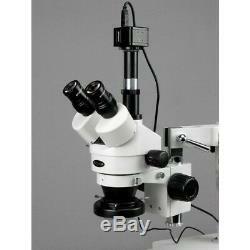 3D boom stand allows pointing microscope head in any direction desired. Trinocular port for adding photo/video capability. This is a trinocular 3.5X-45X zoom stereo microscope on a versatile double-arm boom stand with a 4-zone LED illumination, giving crystal clear sharp images and bright cool lighting illumination. It comes with a trinocular head with 30mm super widefield high-eyepoint eyepieces, a heavy-duty double-arm boom stand, and a 144-LED ring light with control box and dimmer. The microscope offers high resolution, super widefield of view, large magnifying zoom range (13:1) and long working distance (8, 200mm). Its trinocular port enables to add photographic or video capability. The versatile double-arm boom stand allows you to turn the microscope head around three different axis (x, y, and z). You can point the microscope head in any direction desired. The 144-LED ring light is lighting-direction changeable and lighting-intensity adjustable, providing cool, even and bright LED illumination. It features a separate control box allowing you to turn on/off each portion of the 4 light zones individually as well as changing the lighting direction so you may obtain the best images for your stereo microscope. 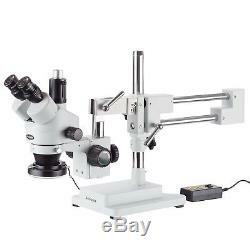 This microscope is an ideal instrument for gemologists, engravers, collectors, manufacturing engineers and anyone in semiconductor and/or electronic industry. 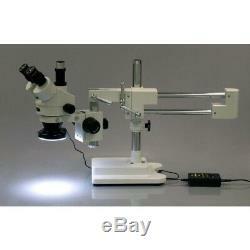 It is also a right microscope for biological laboratory applications that require low heat release. 3.5x-45x continuous zoom magnification power with a 4-zone 144-LED ring light. Intensity-adjustable bright LED cool illumination. 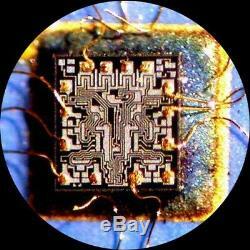 Trinocular design for high quality photo, USB computer and CCD video imaging. Upright tube for USB digital camera, video camcorder or CCD camera. High resolution with great flatness and contrast. Erect stereo sharp images over a super widefield of view. Accurate alignment ensuring fatigue-free comfortable view. Crystal clear original true color images. 45-degree inclined trinocular head with super widefield high-eyepoint eyepieces. 30mm diameter 20mm field of view WF10x super widefield eyepieces. Both ocular-tubes with adjustable diopter. 8 (200mm) large working distance. Versatile boom stand covering large working area. Double-arm design for 3-degree freedom. 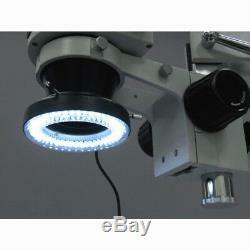 Able to place microscope head toward to any direction. Heavy-duty cast steel stand finished with stain resistant enamel. Rugged solid cast steel base. Manufactured under ISO 9001 quality control standard. Head: 45 degree inclined 360 degree swiveling trinocular. 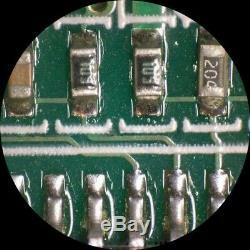 Eyepiece: 30mm super widefield high-eyepoint WF10x. Interpupillary distance: 2-3/16" - 2-15/16"(55-75mm). Field of view: 2-1/2 (65mm). Illumination: 144 white LED bulbs. Power input: 110-240V, 50-60HZ, automatic switching. Boom stand: 20" double-arm (overall length: 30"), 17" high pillar, 10-1/4"x8-1/4"x2-0" solid cast steel base. Super widefield high-eyepoint WF10x eyepieces (pair). Double-arm boom stand with focus rack. 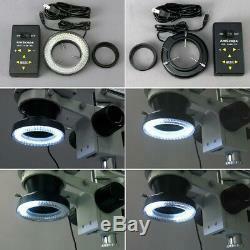 4-zone 144-LED ring light with control box. We are more than happy to help you find the right product for you or answer questions about an order you've already placed. But if there is a problem with the item Please contact our support team FIRST! 80% of the time, the problem can be resolved within a few messages. Once received, most claims are processed within 1-2 weeks, stock permitting. Since 1998, America's doctors, researchers, educators, forensic scientists, and electronic designers have trusted AmScope to deliver high quality microscope solutions for their precision educational and research needs. Our products are manufactured under strict ISO 9001 quality control standards By designing, manufacturing, and distributing our own AmScope brand microscopes and accessories, we keep products affordable while maintaining quality precision. With over 500 models in stock, we are confident that we can meet your microscope needs whether you're a hobbyist, an educator, or an advanced research institution. Our goal is to assist great minds in reaching that "Eureka" moment. Our promise: When you use AmScope, you'll see things bigger! The item "AmScope 3.5X-45X Trinocular Stereo Microscope with 4-Zone 144-LED Ring Light" is in sale since Thursday, February 11, 2016.